The critically acclaimed production of the Boublil and Schonberg's legendary musical Miss Saigon is embarking on its huge UK Tour, taking the success it had whilst being in London's West End through to venues across the country until 2018. With producer Cameron Mackintosh at the very heart of bringing this epic production to the stage with a company of 60 in tow, they bring to life a timeless love story surrounding by history. Having not particularly enjoyed my first encounter with this musical when I saw it whilst it was in London, mostly due to lack of sound, I was thrilled to see how such a big production would be transferred into Leicester's Curve Theatre. The story begins in the last days of the Vietnam War, a 17 a year old girl (Kim) is thrust into the unknown, forced to work in a Saigon bar full of dancers and American soldiers. The bar is ran by a prominent character known to many as the Engineer. In the bar she meets and falls in love with an American GI called Chris, however their love is torn apart by the fall of Saigon and the love feels like it's no more exists. 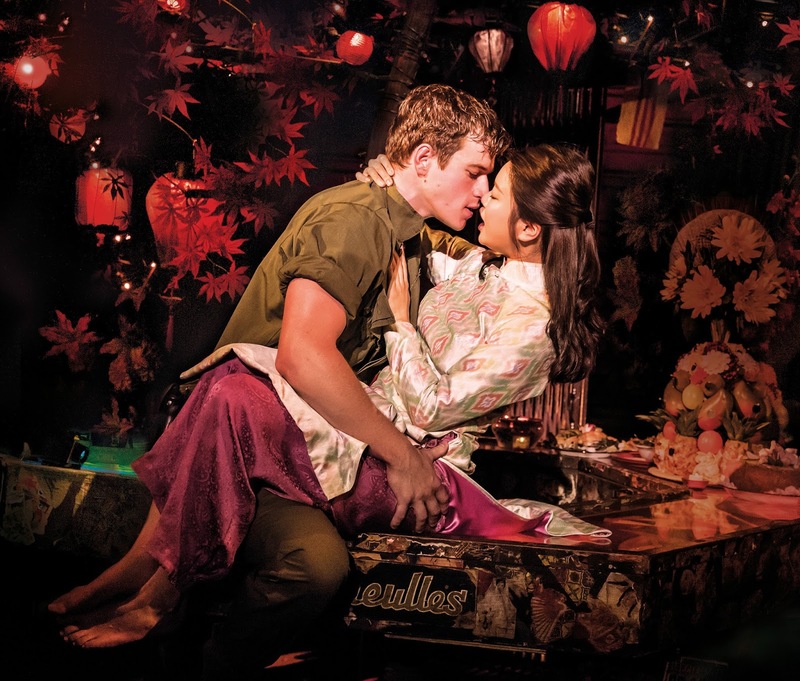 Kim spends 3 years on a journey of survival to find her way back into the arms of Chris, whose life has moved on from Saigon, he has a new wife on his arm and no idea that he has fathered Kim's son. The themes that are embedded within the set design are as big emotionally as they are physically present. The themes of love, loyalty and duty are so prominent through the production and presented well. The musical production is a complete triumph from start to finish with the entire set and set-pieces helping to take centre stage in setting the various different scenes and atmospheres that are sometimes only lit up by a few stage lights. There is a real great play with contrast between the sleazy glitz of Saigon's bars and clubs to the American embassy. One of the most significant moments for me within the musical was the scene where the Americans are seen to be evacuated in a chaotic manner from the embassy, with a real lack of organisation, it's very frantic and tense. All of the sudden we hear the thundering, overwhelming sound of an oncoming helicopter and it's soon obvious to the audience that the locals are swarming towards it, helpless and desperate to not be left behind. There was real artistic masterpiece and definite 'wow' factor as a helicopter comes to the forefront of the stage, something I hadn't expected would be recreated on the UK Tour. 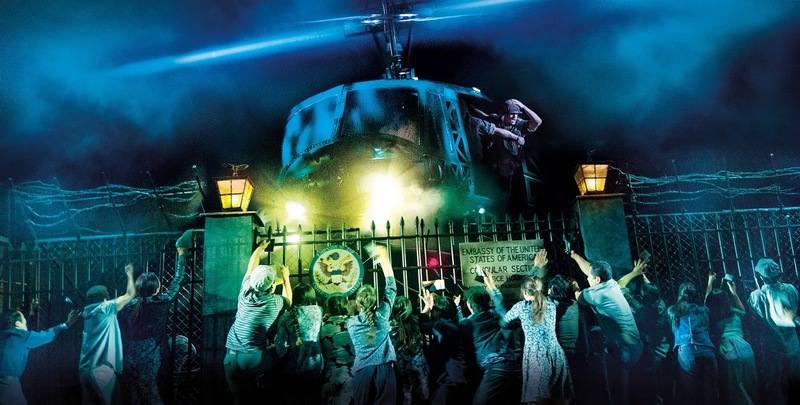 Often I feel like UK Tour are a more condensed version of a London smash hit but Cameron Mackintosh and his creative team hit the nail on the head with this production and it was flawless! Leading characters Kim, played by Sooha Kim and Chris played by Ashley Gilmour really grabbed the audiences attention with their raw, heartfelt emotion and vocals that really brought the house down. There was no doubt that these two characters aligned well with one another, they're chemistry was very effective within their roles and in some fast paced song numbers they managed to articulate every single word well. Watching Ryan O'Gorman undertake a different role after seeing him play Tom Collins in the recent RENT UK Tour production was very refreshing, he executed his role as John well and was emotionally gripping in the musical number Bui Doi. The Engineer, a eccentric and very much a dreamer character was captivated beautifully by Red Concepcion. He even managed to get a few laughs from the audience as he told tales of his dreams and aspirations. Of course the leading cast had incredible support from the entire cast in order to create such a moving masterpiece of a musical, the choreography was executed with flare and sharpness. Particularly in The Morning of the Dragon where the choreographic is so specific and sometimes linear. All in all, I was highly changed in my opinions of Miss Saigon on seeing the UK Tour production, it's captivated my emotions and was one of the best productions I had seen within the Curve Theatre in a long time. I wouldn't want you to miss it whilst it embarks on it's UK Tour, it's not something you want to pass! This sounds like an interesting production! There isn't a whole lot of representation for asian women as leading roles in the media, but maybe there is hope for theater. I would love to see this, it looks like a great production! I love musicals and my mom would always listen to different ones when I was small. This sounds like a beautiful show, and has quite the story! I'd love to see it if they tour North America. Thanks for the review! Honestly the most beautiful and amazing show I have ever seen ... I laughed I cried and a standing ovation was well deserved. I have seen this only on DVD but play it often as I adore the music & love the play. I am so excited to have tickets booked for later this year & can't wait.Meanwhile I have Les Mis coming up this Wednesday another first for me apart form the dvd's I have. This looks so interesting! I'll have to check it out. This show is amazing. I've just booked to see it again on Manchester.